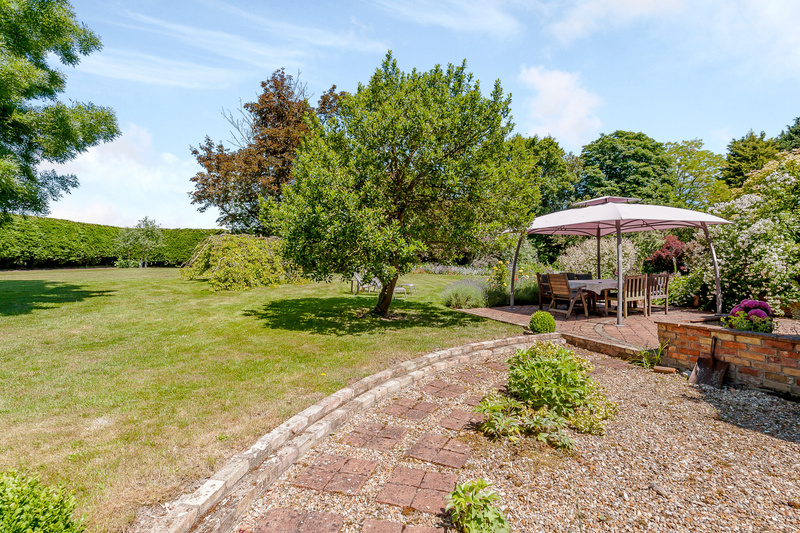 An attractive Grade II Listed former farmhouse with grounds extending to 0.8 acre in a delightful setting overlooking the parish church and backing onto farmland. 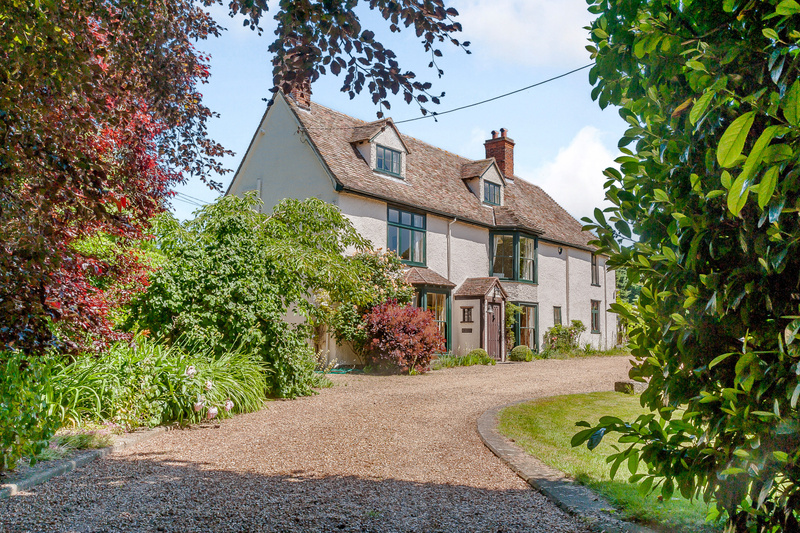 Church Farmhouse is believed to date from the turn of the seventeenth and eighteenth centuries and is in an idyllic location in the heart of the village, at the end of a quiet lane and overlooking the parish church. 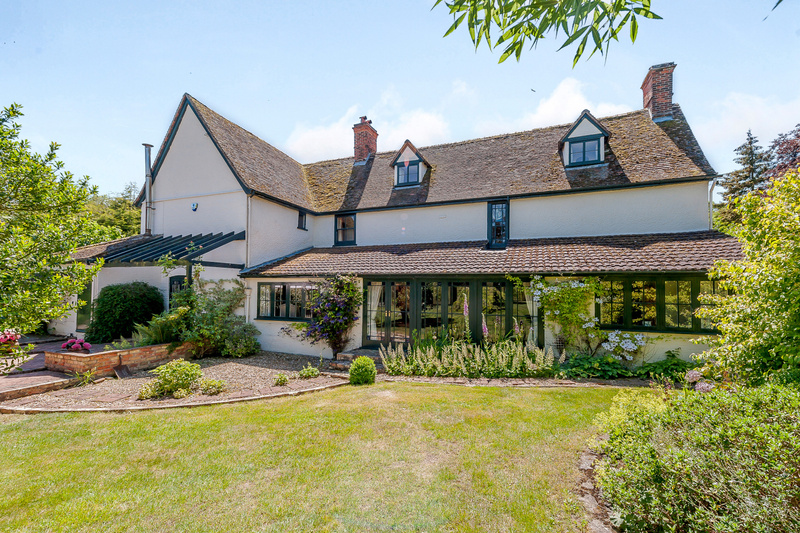 Set in beautiful private grounds, the property has well-proportioned rooms with a wealth of original features including large inglenook fireplaces and exposed timbers. The main entrance opens into the front hall with the main staircase off. The library is a bright room with bay window and built-in bookcases, open fireplace with brick hearth and log burner with cupboard and shelves to one side, 2 large walk-in cupboards and stripped timber floor. The back hall has a cloakroom with a W.C. and hand basin set in a Victorian washstand and a door to the garden allowing direct access to the planned garage. Oak flooring. 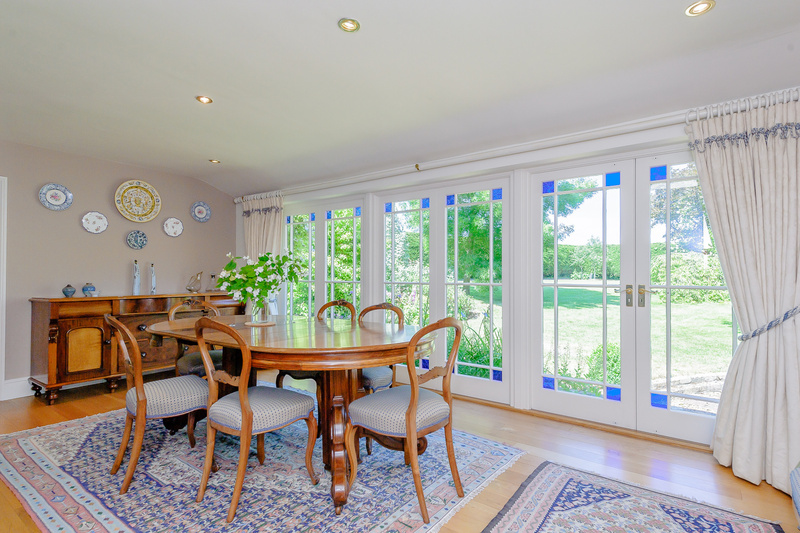 The dining room is a lovely bright room with oak flooring and full height windows incorporating stained glass panels and French window overlooking the garden. The drawing room features an impressive wide inglenook with display niches and pamment tiled hearth with bookcases to one side. The Snug has a good range of recessed shelves and built-in cupboards. 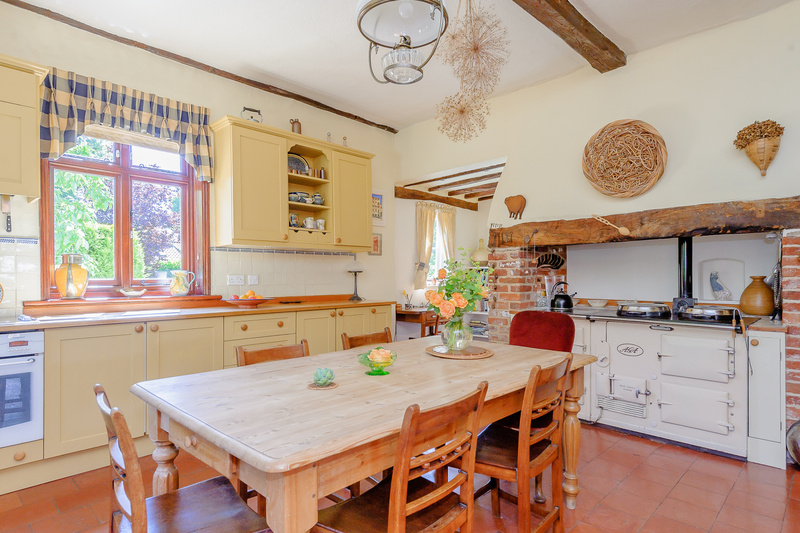 The Farmhouse kitchen has another large inglenook which incorporates a four-oven oil fired Aga with tiled surface around and arched recess – with the original oven door – opening to one side. Range of painted timber units with timber work surface above and tiled splashback, space and plumbing for dish washer, built-in oven with ceramic hob above. Double sink with mixer tap, Quarry tiled floor and door to side patio area. The study/hall is located off the kitchen with secondary staircase to the first floor, French windows to patio, built in cupboards and quarry tiled floor. The utility/cloakroom has space and plumbing for a washing machine and dryer, quarry tiled floor and wall cupboards with stainless steel sink and W.C.
On the first floor the landing runs across the back of the house with stairs to the second floor, airing cupboard and 2 linen cupboards. Bedroom 4/guest room with built in wardrobe has a shower room adjacent which can be used en suite or as a second family shower room. This has been recently re-fitted with hand basin, W.C., bidet and shower cubicle with drench shower and additional hand shower, and oak flooring. 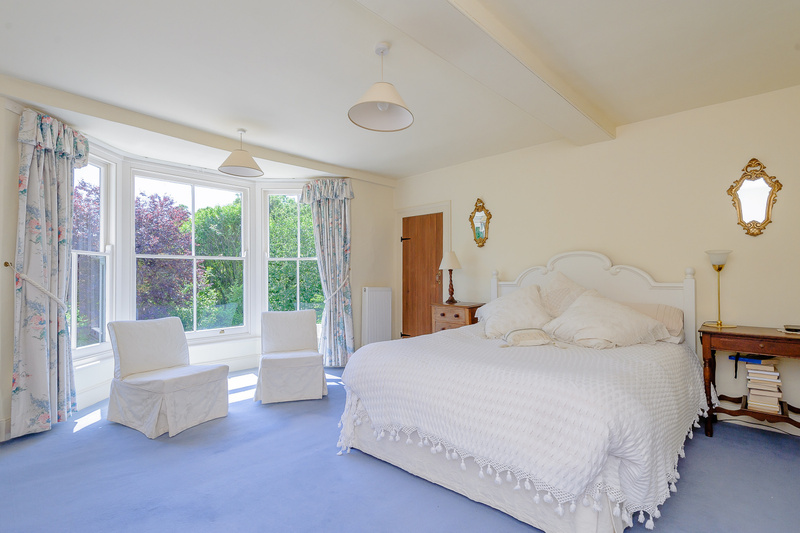 Bedroom 1 is a bright room with bay window, dressing room and walk-in wardrobe with door to bedroom 2 – a double aspect room at the front of the house. Bedroom 3 is east facing with built in wardrobe. The family bathroom has a modern suite comprising of a W.C, bidet and wash hand basin set in a Victorian wash stand and bath with tiled surround and hand shower. Ladder towel rail, half tiled walls and oak floor. 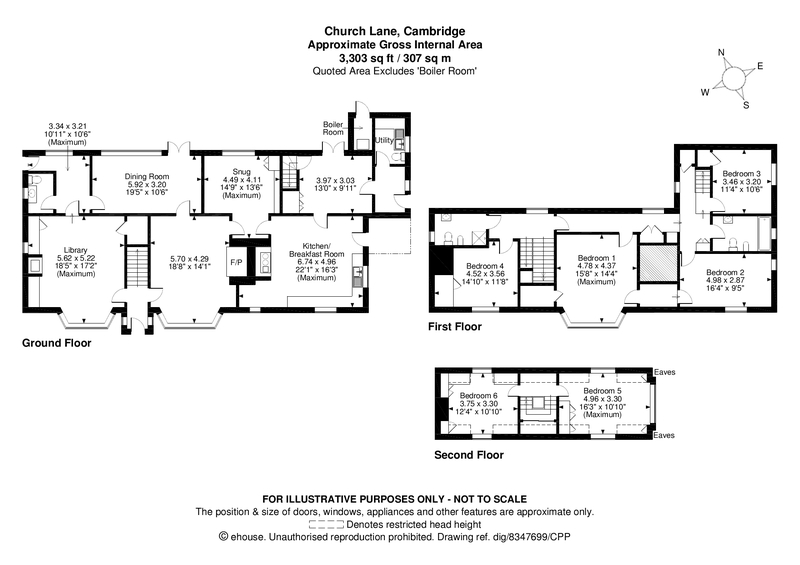 On the second floor are two further attic bedrooms, both with fitted furniture and lovely views of the church. 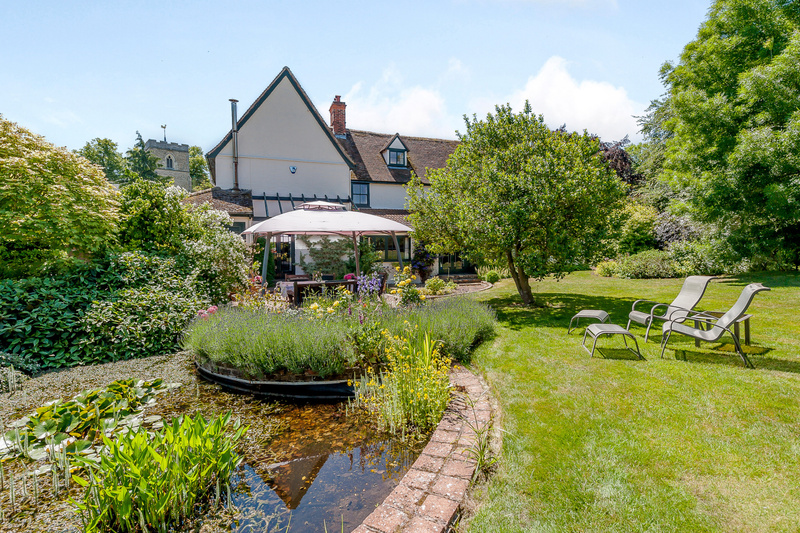 The property is set in beautiful mature gardens with sweeping driveway and ample parking for several vehicles and there is a small pond by the front entrance. Small courtyard outside the kitchen door with large loggia incorporating a bench. 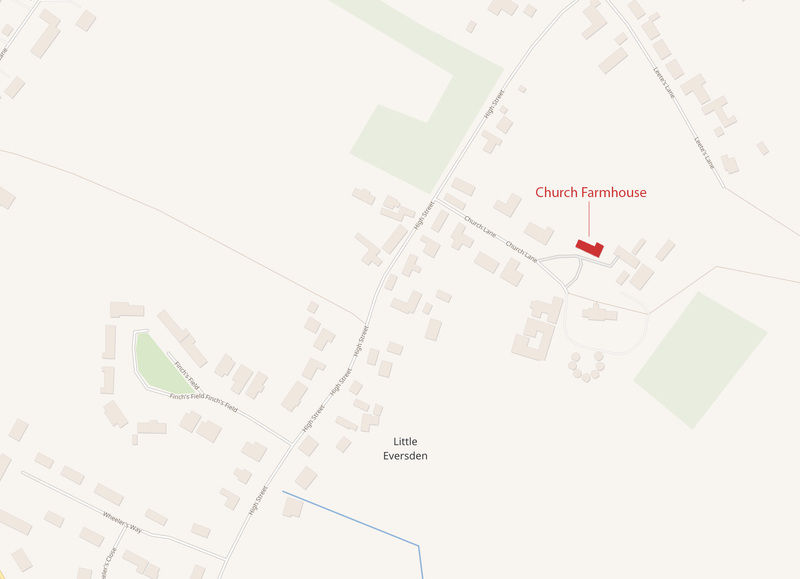 Note: Planning permission has been granted for a double garage on the west side of the house, shown edged in light blue on the plan.